Patel said any reservation over and above the existing 49 per cent limit is not possible to implement. AHMEDABAD: Gujarat Deputy Chief Minister Nitin Patel today said a meeting of the Congress and Patel quota agitators was a "total failure" and the opposition party is just trying to drag the reservation issue till the Assembly polls to get votes of the Patidar community. 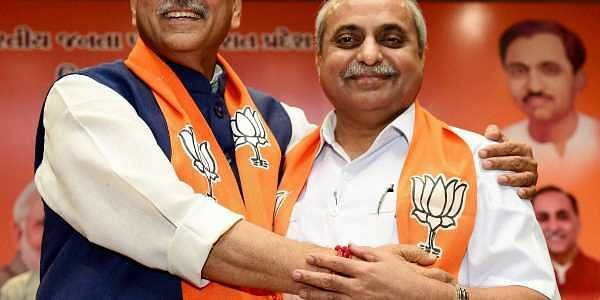 Nitin Patel claimed the meeting, between a Congress delegation led by Kapil Sibal and members of the Patidar Anamat Andolan Samiti(PAAS) on Wednesday here, was an attempt to "deceive" the influential community and aimed at finding ways to help the opposition party in the next month's polls. "Though it's been two days, neither the Congress nor the PAAS has said anything about the outcome of the meeting. It is very clear that the meeting was a total failure. "We believe that whatever formula was offered by Sibal was just an attempt to drag the issue of reservation till the polls so that the Congress gets votes from the community," the senior BJP leader said. "Our sources have said the Congress might have offered 10 per cent additional quota beyond the existing 49 per cent. But, if you remember, the PAAS has always maintained that they want to be included in the 49 per cent quota, because anything above that cap is not possible due to a past Supreme Court order," he told reporters here. Thirteen members of the Hardik Patel-led PAAS held talks with Sibal to know how the party plans to grant reservation to the Patidars if voted to power in the upcoming Assembly polls. During the meeting, the Congress gave three options to the PAAS, spearheading the quota stir, on reservation. The organisation members have said they would consult Hardik Patel, leaders of the community, and legal experts before taking a call on the issue. According to Patel, any effort to create a separate backward class category for the Patidars by passing a Bill in the Assembly is bound to fall through. "Just two days back, the Rajasthan High Court stayed additional quota given to the Gujjars by the government. Thus, if the Congress is promising to do the same here by passing a Bill and sending it to Parliament, then it will be nothing but an attempt to misguide the Patidars," said the BJP leader.